Back in the seventh grade, I had a science teacher who for Libertyville, the Illinois-ian hamlet where I was raised, was a tad unconventional. In a sea of conformity there she stood: a hippie agnostic biology teacher who didn’t own a television and who lived (probably on a farm! eek!) way out in the boonies somewhere. I remember, for example, when she told us students that she didn’t teach her kids about santa claus, and that pretty much rocking my world to the core. (It should be noted that I believed in santa claus until I was in the fifth grade, and so maybe was still suffering the aftershocks from that revelation) But still, to us awkward and goofy adolescents, she was a strange bird indeed. One of her final acts as biololgy teacher was to make each of us students do a project, which we of course weren’t allowed to choose, that would illustrate some natural process. My best friend Leslie and I were charged with the task of making kimchee. Again, let me emphasize… this was the suburbs of Chicago, land of Wonder Bread and McDonald’s and Miracle Whip. 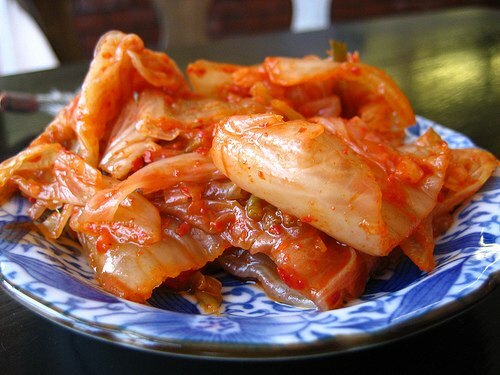 Kimchee was about as foreign to us as an alien landing on the roof of the junior high and teaching us all to tap dance. I remember going through the recipe and becoming increasingly baffled… Cabbage?! What the heck?! Who even knows how to cut it up, let alone eat it?! Spices so hot that they burned the inside of my nostrils just by putting my nose to the jar, vinegar, a smelly substance associated only with dyeing Easter eggs, and then the coup de grace… Cram all that stuff into a jar and bury it (Yes! Bury it!) in the backyard. And then we were expected to EAT it?! Tomorrow night, Saxelby Cheesemongers is celebrating cheese and kimchee, a fermented odd couple turned match made in heaven at Jimmy’s no 43, the little beer haven on 7th street with a big big heart. Come on out and taste for yourself how stinky cheese and stinky cabbage get down! And have a pint while you’re doing it. Hope to see you there! $25 for three pairings of farmstead cheese, locally made kimchee, and delicious craft beer! On Cutting the Curd this week, I interviewed Angela Miller, farmer, literary agent, and born comedian about her new book ‘Hay Fever: How Chasing a Dream on a Vermont Farm Changed My Life’ If you have dreams of starting a cheese farm, listen in or grab a copy of the book for some cautionary tales spiked with hearty laughter.